Other Products: Nest, Fairies image Internet, Rhine Stones Pink, Distress Ink Vintage Photo, 7-7-Shadow Box Digi cuts, Cardstock White, Cardstock Bazzill Rain, Green Cardstock, pearl pen Creme, Pearl pen blue, Heat gun, Heat tool, Embossing powder Clear, Acetate, Versamark. 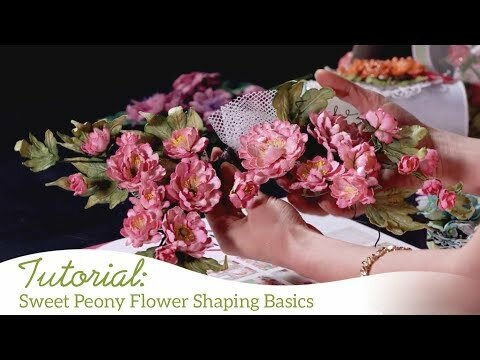 For more tips on creating with the Sweet Peony collection, watch the tutorial at https://youtu.be/L9_MLkvpGPQ. Instructions: Click here to view more photos of this project. Cut the Shadow box out of the Bazzill Rain Color and Glue it together by following the instructions here. Take a nice sheet of the paper collection and glue it in the box, this is your back. Stamp with Rhubarb Stalk the sentiment Butterfly Kisses and Wonderful Wishes from the Butterfly Kisses stamp. Put some glue on the Butterfly and put some of the Krystallos Shard glass on it. Cut a piece of Acetate at 6 1/2 by 6 1/2 and glue this on top of the box, then on top of that you glue the square with the shape. Cut 2 Borders from the regal Border and Pockets die from the paper collection and Ink the edges with the Vintage Photo Distress Ink, glue 1 on the bottom part, and 1 on the right side. Stamp 3 Butterflies with the Fluttering Butterfly stamp in Black Tuxedo Ink on White cardstock then color them with the memento Inks In the Colors: Teal Zeal, Rose Bud, Lulu Lavender, Peanut Brittle, New Sprout and Bamboo Leaves. Cut them out with the coordinating dies, get some VersaMark Ink on them and cover them with Clear Embossing powder and melt that with a heat tool. Now glue 2 Butterflies on top of each other and shape the upper wings so that they are standing up, put some glue and some Krystallos Shard glass on the bottom part of the Butterfly. Now glue this one on the left upper corner. Glue the other Butterfly upside down behind the fairy so now it looks like his wings. Stamp the Large and small peonies on White cardstock with the Rhubarb Stalk and cut them out with the coordinating dies, then color them with the Peanut Brittle in the middle and the rest with Pearlescent Poppy and shape them on the shaping mat with the shaping tools from the Deluxe Flower Shaping Kit. Cut some large and small Poinsettia's out of green cardstock and spray them lightly wet and roll the petals between your fingers, make a hole in them and glue them on the bottom of the flower! Now take 7 small ones and put a stamen in and glue them under the butterfly on the left side. Color the Big ones in the same colors as the small ones, shape them with the shaping tools on the shaping mat, make a hole in them and put some stamens in, now glue them on the right bottom corner. Under those Big flowers you can glue some smaller ones too. You can make a bud with 1 middle size flower, just roll it up and glue a (poinsettia) around it. Glue the fairy with the wings on top of that, on the other flower you can glue a fairy too. Put some blue dots in the nest with the Blue pearl pen and glue it in between the leaves. Now Stamp all the leaves you want from the various collections with the Tuxedo black and color them in different colors of green, like the Bamboo leaves and the New Sprout and put some Distress Ink on them too. Shape them and then arrange them in between your flowers. Finish the box off with some Pink Rhinestones on some leaves and on the box, on the smaller leaves you can put some pearls with the Pearlpen.